This release: artist name unboxed on frontcover, album ad on backcover; moulded labels, writing credits: Geratsch/Beierle (A); Geratsch (B). 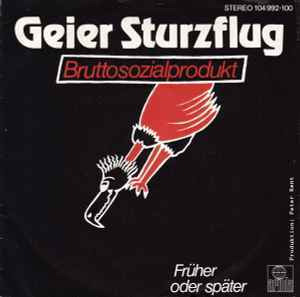 Bruttosozialprodukt: artist name unboxed on frontcover, album ad on backcover; moulded labels, writing credits: Geratsch (A+B). Bruttosozialprodukt: artist name unboxed on frontcover, album ad on backcover; paper labels. Bruttosozialprodukt: artist name in a "cloud" on front/backcover; moulded labels, writing credits: Geratsch (A+B). Bruttosozialprodukt: artist name unboxed on front/backcover; paper labels.